Leadership Spokane delivers dedicated leaders that collaborate in order to grow an active and diverse network that serves and strengthens our communities. 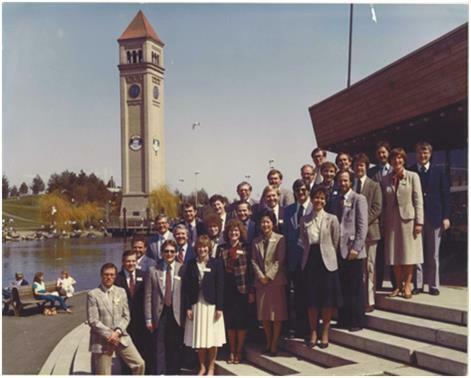 Leadership Spokane was founded by the Spokane Chamber of Commerce and its business leaders to maintain the momentum of leadership and development in the Spokane community, following the incredibly successful World’s Fair Expo ’74. Since 1982, Leadership Spokane has served as a premier leadership training course for established and emerging community leaders. With the first graduating class consisting of 27 students in 1983, Leadership Spokane has grown into a vibrant and well-respected program with 1,217 alumni. In 1996 a Youth program was proposed in order to promote the leaders of tomorrow. This session was open to high school sophomores, juniors and seniors in the Spokane area with 30 students in the first graduating class. Today, there are 583 graduates of the youth program representing high schools throughout Spokane County. Leadership Spokane exposes members to current issues such as economy, education, history, and culture, and encourages students to use problem solving skills to figure out what is happening in Spokane, why, and how to improve it. Leadership Spokane is grateful for our founding investors, through their vision we continue to build the leadership mission and community of alumni for Leadership Spokane. Washington Water Power, now Avista Corp. Leadership Spokane respects the dignity of individuals and is committed to non-discrimination in all of its programs, services, and events. Leadership Spokane is consciously and proactively welcoming of all areas of diversity including, but not limited to, race, ethnicity, color, national origin, ancestry, gender, sexual orientation or identity, religion, age, socioeconomic status, marital status, language, disability, political opinion or immigration status. Leadership Spokane encourages you to join us in supporting this policy through leadership and personal example.